Thiery was visibly concerned at the finish as he waited for the timekeepers to do their calculations, then rode off when it became less certain that he had hung on. When the decision came through the Dutch riders were elated, celebrating loudly, while Theiry returned several minutes later looking deflated. The 144.6 kilometre stage from Naas featured a long distance move of eight riders. This began almost immediately after the start when Marc Potts (Ireland National Team), Russell Downing (Ireland Holdsworth Pro Racing Team), Fintan Ryan (Cycling Leinster) and Philip Lavery (Cork STRATA 3 – VeloRevolution Cycling Team) attacked. Fraser Rounds (Britain Team KTM), Curtis White (USA Jelly Belly P/B Maxxis), Jake Alderman and Cameron Jeffers of the Britain Saint Piran Elite Cycling Team subsequently bridged across. Others tried to chase but were unable to get across the gap. The break built a lead of two minutes and 45 seconds, then chasing from behind whittled it down gradually. On the first lap of two 13.9 kilometre finishing circuits, Potts and Lavery got clear from the break but were hauled back. On the last lap, Potts, White and Alderman then attacked the other breakaway riders, leaving them to be caught. Alderman pushed on alone but was caught and passed by Sjoerd Bax (Netherlands Delta Cycling X), who built a nine second lead. 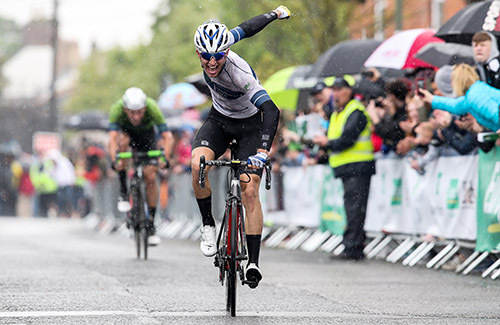 Robert-Jon McCarthy (Ireland National Team) was best Irishman on the stage, winning the bunch sprint for fourth, while the Italian Matteo Cigala (Westmeath Viner-Caremark – Pactimo) in sixth was best county rider. Damien Shaw (Holdsworth Pro Racing Team) dropped one place to fourth but was best Irishman, 12 seconds behind Bugter. Mark Dowling (Cycling Leinster) was best county rider overall. Bugter won the points classification, Lukas Ruegg (Switzerland National Team) won the mountains competition and Ghys was best young rider. Raymond Cullen (Tipperary Panduit) was best category 2 rider. Netherlands Delta Cycling X won the overall team competition, while Westmeath Viner – Caremark – Pactimo was the best county squad. The final stage of the Rás Tailteann extended 144.6 kilometre race from Naas to Skerries. The platforms for attacks were five category three climbs, namely the Hill of Allen (km 15.6), Plukhimin (km 88.1), the Cross of the Cage (km 108) and the two ascents of the Black Hills (km 121.4 and 135.4) on the finishing circuit in Skerries. Soon after the start, four riders attacked – Marc Potts (Ireland National Team), Russell Downing (Ireland Holdsworth Pro Racing Team), Fintan Ryan (Cycling Leinster) and Philip Lavery (Cork STRATA 3 – VeloRevolution Cycling Team). They were joined soon afterwards by Fraser Rounds (Britain Team KTM), and have eight seconds after about four kilometres. Three kilometres later Curtis White (USA Jelly Belly P/B Maxxis) bridged across, and after 11 kilometres the six riders were 26 seconds ahead of a lone chaser. He was caught very soon afterwards, but soon afterwards three others started chasing. Ciaran McVeigh (Antrim Velo Cafe Magasin PowerHouse Sport), Lindsay Watson (Antrim Velo Cafe Magasin PowerHouse Sport) and Michael Fitzgerald (Cork STRATA 3 – VeloRevolution Cycling Team) set about closing the gap, but Fitzgerald slipped back soon afterwards. White took the day’s first prime at the Hill of Allen (km 15.6), ahead of Potts, Lavery and Rounds. After 21 kilometres the chasers were 30 seconds back, with the peloton close by. They were caught soon afterwards. Two others then chased, Jake Alderman and Cameron Jeffers of the Britain Saint Piran Elite Cycling Team, and bridged after 28 kilometres. One other, Cameron Jeffers (Britain Saint Piran Elite Cycling Team), had also been chasing and was 28 seconds back at that point. The main field was 58 seconds behind then. Jeffers realised that it was impossible to catch eight riders solo and sat up. Kieran Crean (Cork Blarney RC) then attacked, but didn’t get far. He was caught after several minutes and, in Kilcock after 42 kilometres, the break was two minute and forty seconds ahead. This gap remained constant for a long time afterwards. At Rathoathe (km. 77), the break was two minutes 47 ahead. The peloton accelerated after that, with the Switzerland National Team of race leader Cyrille Thiery working to gradually reduce the break’s advantage. White took the category 3 climb of Plukhimin (km 88.1), ahead of Alderman, Potts and Jeffers. Four kilometres later, at kilometre 92, the gap was two minutes and ten seconds, and this dropped to one minute 57 seconds. However the peloton backed off slightly and Samuel Tillett (Wales Racing Academy – National Team) jumped clear of the bunch around kilometre 97. He was two and a half minutes back two kilometres later, with the peloton a further 15 seconds behind. Tillett’s chase ended around kilometre 105 when he was caught by the peloton. Ahead, Jeffers lead White, Rounds and Potts over the summit of the category 3 climb of the Cross of the Cage (km 108). Two kilometres later the gap was one minute 45 seconds, at on the first crossing of the finish line with two laps to go, the break was just one minute and ten seconds ahead. The finishing circuits were 13.9 kilometres in length and included the category three ascent of Black Hills. Jeffers was first to the summit, with Potts, Lavery and White next over. Potts and Lavery felt good and both tried to get clear, but they were hauled back. The increased speed and intensity led to Rounds and Ryan being dropped from the break. Heading onto the final lap, Maximilian Stedman (Britain Canyon Eisberg) attacked the bunch and caught the dropped duo. However the bunch reeled them in and continued closing on the break. Potts, White and Alderman then attacked the other breakaway riders, leaving them to be caught. Alderman pushed on alone but was caught and passed by Sjoerd Bax (Netherlands Delta Cycling X), who built a nine second lead. Dramatically, the green jersey of Luuc Bugter (Netherlands Delta Cycling X), the white jersey of Robbe Ghys (Belgian National Team) and the blue jersey of Mark Dowling (Cycling Leinster) attacked on the climb. Bax took the prime, with Bugter leading Matteo Cigala (Westmeath Viner-Caremark – Pactimo) and Robbe Ghys (Belgian National Team) over the top. Race leader Thiery had started the day just ten seconds ahead of Bugter and tried to get him back. Bugter pushed on and caught his teammate Bax, with the duo then being joined by Ghys. They opened a 15 seconds gap, making Bugter race leader on the road. This increased further to 23 seconds but, with the yellow jersey and Ireland Holdsworth Pro Racing chasing, the gap dropped to eight seconds. It looked like Thiery might be able to save his race but the leaders accelerated again. Ghys took the stage win ahead of Bugter, with Bax six seconds back in third and Robert-Jon McCarthy (Ireland Racing Team) taking the bunch sprint for fourth. Crucially, that bunch was 12 seconds back and Bugter was awarded the overall win by 1 second.